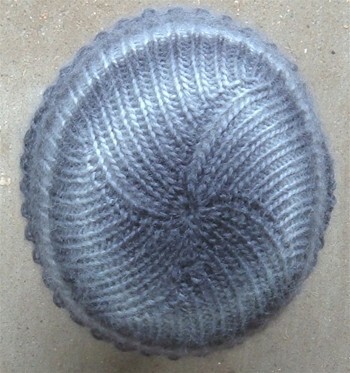 This is what it looks like when a control freak tight knitter makes The Marsan Watchcap for the first time. It's way too freakin' small. I think we'll blame the yarn since it's that nasty SWS again. I'm going to dig out some black wool and go up a needle size or two because I just don't see this fitting my favorite little pin head. I shouldn't call him that, but I'm sick and in a mood, so I am. I don't see a problem as he's sick, too, and afraid of me. Shut up, that's hardly a surprise, now is it? 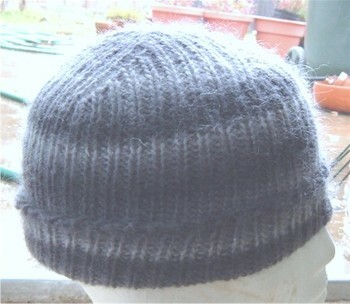 While not the worst hat I've ever knit, I still think it's a bit on the teeny side ( and he deserves better). It was a struggle to get it on the foam head and that can't be good. If I'm right and it doesn't fit him, I'll have another go at it with the SWS, so he can have a hat that goes with that scarf. We're a people who like to have stuff that 'goes'. Yeah, we really are that weird. In other news, I did manage to sleep last night, so I'm feeling better in that department. Even if I remain weird, moody and on the lookout for someone to drop kick. That's all semi-normal if we were going to be painfully honest. Ever been in a relationship that you can't exactly explain to people? Fine. I'm the town freak. I have this amazing friend who is a straight man. Yeah, I'm shocked, too. Believe me. I was whining to him about a website last week. I crashed it trying to open an account. The next day, the site was back and I was all ready to order yarn. Sitting here with a Visa between my teeth. Ready to go. Shut up. Turns out they don't take plastic. More whining on my part. He asked for a link to the site while assuring me that I had not crashed the site. He thinks he knows me, but he has no idea how much computers hate me. * Then he wanted to know what I wanted and I told him because I have finally stopped fighting him and questioning what he means. Yeah, too late for it to matter, but I am learning how to overcome being so bloody stubborn. Yesterday, a box arrived. Actually, two boxes arrived, but that's another story. The yarns are lace weight. 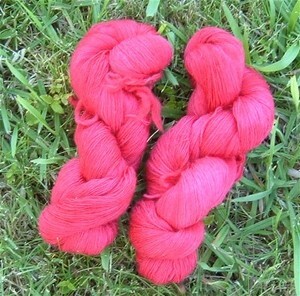 I think I have plans for the red yarn that was a pink on the site. Gotta love monitors, right? The red is yummier in person. It just didn't want it's photo taken, so it was making faces at the camera. The timing for this was perfect as I knew it would be when I realized what he was up to. It was the perfect blog day gift. Made truly special because of who it came from. I've promised to make something pretty and hope I can. Something to make me happy every time I see it as it will remind me of someone very special. * I once had a check crash a cash register at Safeway because it didn't like the paper my check was printed on. I had to stand there and wait while the thing rebooted... with people lining up behind me. I wanted to die. The answer to the question about the blog comment I made two years ago that changed two lives was not, in fact, KnittyOtter. We've known each other longer than that. She's still adorable and young and I've become a bitter old hag. The answer was my boy. I left a comment on his blog, he e-mailed me a reply and it was a blur of flirting after that. I cannot believe it's been two years. I'm not really sure where the time went and I'd rather not look close enough to find out. 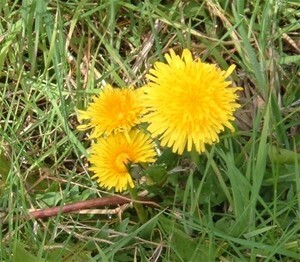 The yellow blooming weeds are for Norma since she likes to eat their leaves. They will be gone soon. Along with their singing friends. Now that spring is really here, I have to stop hiding with a sock and get outside and start killing things. It's ironic that a season so full of renewal and rebirth sends me out to bring death and destruction to those happy little green things that we've awaited for all winter. But it's that or become a fire a hazard because, ya'll, summer is coming. Tomorrow a rant about yarn and a pair of socks made out of the offending yarn. If you do, did you remember to change the time? What about the smoke alarm and clock batteries? Do you know that my local Longs Drugs store has leggy looking tomato plants for sale? Doesn't that just make you sick? Did you know that two years ago I made a comment on a blog that changed my life? What if I said it changed two lives? Would you believe a cat can take a sock in progress hostage? Wanna come over and kill some weeds? Would you believe that I almost always win the game Questions Only? Even though, this one lives out in the middle of no-where back yarn land, he still loves his Sandy and sings to her while gently wiggling in the breeze. 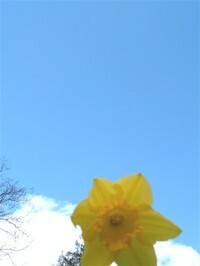 Imagine what the guy next door must have been thinking while he watched me try to get that shot with the daff more or less centered. I was out there for quite a while. It's a good thing that I'm pretty much shameless at this point when it comes to taking pictures. By the time this is posted, my doc socks will be in the mail. Photos and info on the traditional day of the socks. Now that I'm done with those, I can move on to my next pair of socks. DaveYarn, of course. Just need to pick a pattern and the right yarn. And speaking of yarn*, the boy and I are loving the looks and name of some new to me/us sock yarns from Crystal Palace. We just need to find it in a store close to one of us. I want to touch, feel and maybe sniff first before buying. Panda Cotton is 55% bamboo 24% cotton and 21% elastic nylon. Panda Wool is 46% bamboo 43% wool and 11% nylon. We've both found colors that we love. Now the search is on. 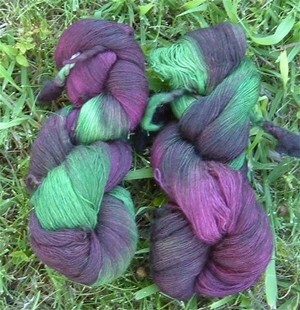 I don't think I've seen it at my LYS, but Babetta does have a thing for sock yarn. If they don't stock it, I have high hopes that I can talk her into it. Although, there is a chance she has it and I haven't seen it yet. There is a lot of yarn in that small-ish store. It's hard to see it all and remember what you've seen. * I keep typing 'yearn' when I mean 'yarn'. Think that means something?